#37. 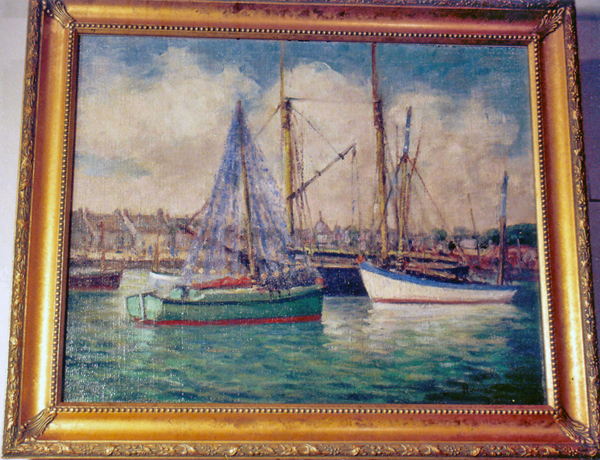 Oil on canvas, seascape titled on verso "Fishing Boats Concarneau Brittany"
Signed Howard B. Spencer. (Howard Bonnell Spencer, 1888 - 1967, New York, N.Y. He did primarily landscapes and ports. Listed in Who Was Who in American Art, Dictionary of American Painters by Mantle Fielding, Mallett's Index of Artists, and Davenport's Art Reference. Size including frame: 24 x 20 inches; without frame: 19 x 15 inches.